I'm all for choice, after all variety is the spice of life, but LG might be getting a little carried away with itself as the L70 struggles to carve out a space in the busy budget market. The LG L70 is the troublesome middle child of the Korean firm's L-series smartphone trifecta, bringing a pretty pedestrian set of specifications to the table. You get a 4.5-inch, 800 x 480 display which makes the L70 a little easier to hold than the larger L90, although there isn't a huge amount in it. The resolution is again very middle of the road, suitable for general tasks, but games and movies don't exactly excel here. The 1.2GHz dual-core processor and 1GB of RAM is plenty for Android 4.4 KitKat to run relatively smoothly on and the L70 can perform all the basic tasks without any fuss. High definition movies and graphically intensive games are probably best avoided however, and lag sometimes crept in when I opened up a multitude of applications. Keep on top of your open applications via the multi-tasking menu though and you shouldn't have any trouble. In terms of design the LG L70 is near identical to the L90 - it's just a touch smaller making it easier to hold for those with daintier hands, and the power/lock and volume keys on the side of the handset are easy to hit. The all plastic body does feel a little cheap, but the L70 is a solid handset and the grippy soft-touch back means you're unlikely to see it slip out of your hand. 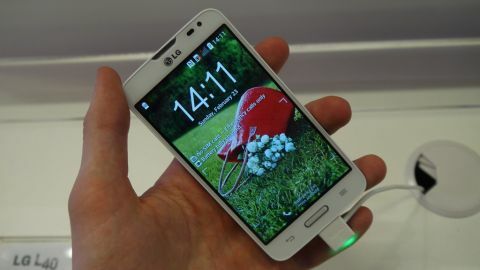 There are no on-screen navigation controls, with LG instead opting for physical keys below the display. I found the controls were easy to hit and responsive to my touch. I applauded the L90 for its IR (infra-red blaster), but unfortunately LG has decided that the L70 isn't worthy of the same functionality, which is a bit of a shame. As with all of the L-Series smartphones the L70 sports LG's Android overlay and its new Knockcode security system. This builds on the firm's KnockOn feature which arrived on the LG G2, allowing you to wake the screen with a double tap, instead of pressing the power key. Knockcode takes it a step further by incorporating your passcode into the knocking motion. Set a pattern between two and eight taps and you can then unlock the L70 without having to press the power key and type in a password or numerical pin. I've found Knockcode to be a little hit and miss on all LG devices which currently use it, and the L70 didn't always register my "knocks." I hope LG will address this with a software update in due time. The 4.5-inch display is a decent size when it comes to tapping out a message, with the keyboard managing to be well spaced allowing for a fast typing speed. LG has stuck an 8MP camera on the back of the L70 and I was able to take some okay shots with it, although I did find the shutter was a little sluggish which means you might miss a precious moment. With the low-end L40 and the slightly larger L90 the LG L70 finds itself in no mans land, filling a gap which probably could have been left unfilled. It's likely to be priced at a similar level to the Moto G, which is a far superior handset, and I fear the L70 may get lost in the bustle of the budget market.